Oh my, what we miss when we put our blinders on and plow through the day. 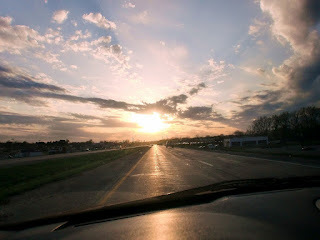 God showers us with blessings every day, even on the road when you're headed to church. While a sunset might be an everyday occurrence, we take its beauty and its splendor for granted. Make this a weekend of shedding the blinders and beholding the breathtaking wonders God has created. They're just for you, just for today, just because He can. 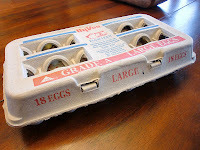 Upon first inspection, this appears to be an ordinary carton of eggs. But that's the idea! Inside is a set of 18 lovely little bird nest cupcakes. Each one is a lemon cake covered with frosting and toasted coconut, then topped with a robin's egg candy. This is the perfect treat for spring, and even though it looks time-consuming and complicated, it's definitely not. 1. Preheat oven to 350 degrees. Line mini muffin tin with paper liners. 2. Fix cake mix as directed on the box. Divide into mini muffin tin lined with paper liners. 3. Bake at 350 degrees for 13 minutes or until a toothpick comes out clean. Remove from pan and cool completely. 4. Turn oven down to 300 degrees. 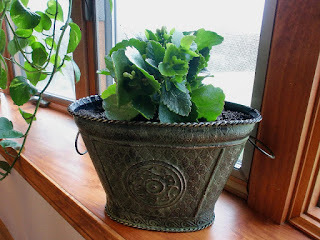 OK, truth be told, you can re-pot plants all four seasons of the year. But it's spring and I'm re-potting a plant, so it makes sense, right? The real reason that this is a big deal is because of my thumb. You probably can't see it from where you're sitting, but my thumb is very, very brown - not a hint of a green thumb anywhere on my body. When I was in college, I killed a cactus. So for any plant of mine to get to the point of needing to be replanted into a larger container, it's really a cause for celebration. I bought this plant as one of four from the grocery store florist. They were adorable, little plants wrapped in brown paper. This is the only one that survived, so I'm being very, very careful with it. Up the hill and off towards the road stands this beautiful old tree. 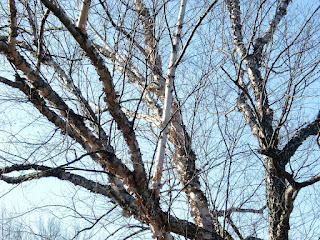 It's my favorite tree on the entire property. It has a lovely secret that you can't see from anywhere, at least not until you're right upon it. 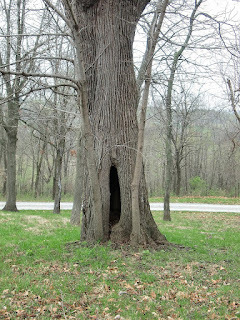 The entire base of the tree is hollow. Not being a tree expert, I don't know if it grew that way, became hollowed out over time or was cleared out by animals or bugs. All I know is that it now has this special trait that separates it from all the other trees in the woods. You can tell when you get close that it has been home to many generations of ... something. It's fun to think about lots of babies being born in that tree, it being used as a safe haven from predators and a lovely place for a summer's afternoon nap. The week tends to get all cluttered up with work, chores, responsibilities and all the extra stuff that we heap upon ourselves. And then the weekend comes and we think we need to get even more done while we have some spare time. That doesn't give us much time, does it? Or much joy in the doing? Make this a weekend of reclaiming the joy that God has richly blessed you with through His salvation - whatever it takes and however long it takes. The joy of the Lord truly is our strength. They beat their little wings against the window pane every night. They can see the light through the glass and they are drawn to it...like a moth to the flame. 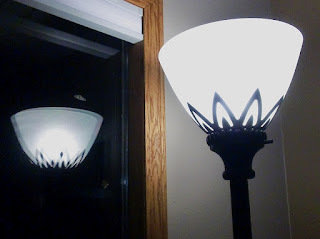 They are moths, and they are drawn to the brightest of lights. You can find them around the security light, the street light and the living room light every single night. We often describe moths as robotic, mindless creatures, following the light like zombies. Maybe in a sense they are and do...but don't they really have the right idea? The moth is simply following the light like it has been programmed to follow. As Christian women, we have also been reprogrammed to seek the Light, the Light of Christ. As the Light of the world, Jesus Christ is drawing us closer and closer to Him, motivating us to follow Him wherever He will lead. It's finally spring in Iowa and our entire household has been cooped up for too long. We were all tense, anxious and ready to let go of some built-up tension. So I opened the back door and released the hounds. Bailey headed down the path between the ponds and was in the water before I could even get off the porch. Her sister wasn't far behind her. Then they ran, and they ran, and they ran. 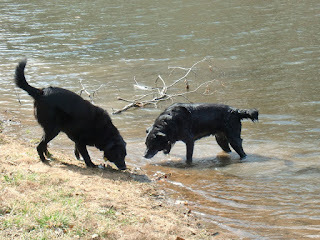 And when Sadie couldn't run anymore, Bailey ran and ran and ran some more. Soon she was all tuckered out and soaked through. I think she explored about half of our 33 acres and would have kept going if she could. 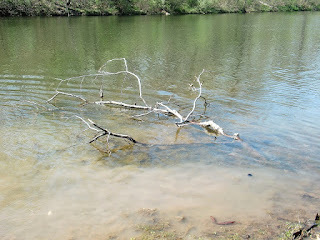 She was too tired to run anymore, so she decided to help Danny fish the big pond. Although her idea of helping was to swim in exactly the spot he wanted to cast into. I don't think he ever caught anything in that area. Silly puppy. 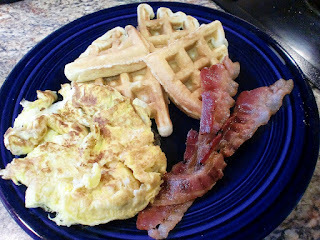 What is it about having breakfast foods for supper that seems so wonderful and decadent? Often we'll rush through the morning and have a little cereal or a protein bar and won't sit down long enough to do more. But come dinnertime, we love those special breakfast treats that we didn't have time for in the morning. Danny gave me a waffle maker (the spinning kind like they have at the hotel) for Christmas, and I'm absolutely in love with it! Even better than the restaurant, I'd say. So why is breakfast for dinner so special? * It's a comfort food. After a long day out in the world, what really compares to waffles and warm syrup, crisp bacon and gooey eggs? * It's out-of-the-ordinary. Sometimes having "the usual" at an unusual time gets us out of a rut, lets us have a little fun and makes us feel like a kid again. Can you believe that it's less than three weeks until Easter? Spring has sprung and it's time to celebrate the resurrection of our Lord and Savior! If you're looking for some crafty ideas for this year's Easter cards, please check out the etsy treasury my friend Katie made. You'll find it here. 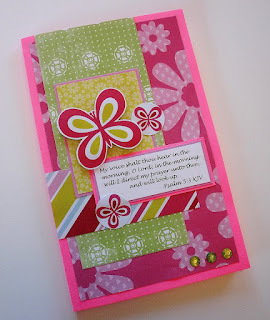 She's found tons of examples of handmade cards that just scream spring. Now go out and get creative! This is exactly what I've felt like for the past couple of weeks. Instead of dropping my baggage at the footstool of the Throne of Grace, I've held on to it. Instead of casting all my cares, I've tied them on a little tighter. And this is the result of holding and tightening and keeping. You get top-heavy and eventually topple over. The inside of this tree was all empty and weak because there was too much at the top, pulling it over. Have you ever felt that way? Are you feeling that way right now? We were never meant to carry the weight of the world around with us. We were never meant to be so overloaded that we reach our breaking point. That is what our relationship with the Lord changes. My chiropractor offers Scripture while he's adjusting your spine. While things are popping and cracking and creaking, he'll ask if you'd rather hear Ephesians or 1 John. I always leave feeling not only physically better, but spiritually renewed as well. He has most of the New Testament memorized and presents it with meaning and understanding. I walked away from my appointments this week with renewed desire to work on my own Scripture verses again. I've been trying to memorize several sections of "women verses" from my favorite sections of the Bible. The only way I can accomplish that, thanks to my terrible, horrible short-term memory, is to have it continually before my eyes. That's why I made these memory verse cards for my desk at work. 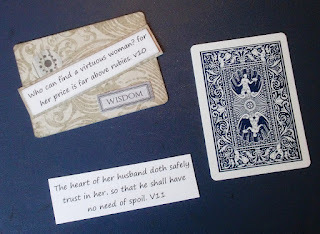 I want desperately to memorize the Proverbs 31 woman, so each of my cards has one verse on it. Then each day I add a new one to the ones I already know. 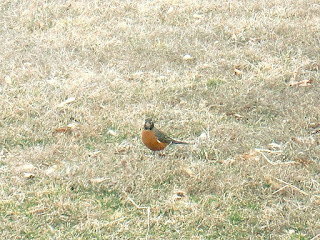 I watched the little robin as he tried to make headway across the yard. He had a terribly strong wind to contend with and he was having problems keeping forward momentum. He had to walk because flying was out of the question with so much working against him. The winds have been incredibly strong here this week, and he was such a tiny little thing. I'd had trouble just getting the car door open because of the wind, so I couldn't imagine how he would be able to fight it. And then I understood how he was progressing. He would walk until the wind picked up, and then he would plant his little feet as firmly into the ground as he could. He tucked his little chin down and braced himself against the gale while his feathers ruffled and the leaves whizzed past. ...then this is what they'd look like! Or maybe reverse Dalmatians. I'm not sure. It had been cold and snowy for many days in a row, and then we enjoyed a few days of what felt like summer because of the sunshine. And then we had this freak day of snow. Danny had driven north about two hours for work and they had nothing. 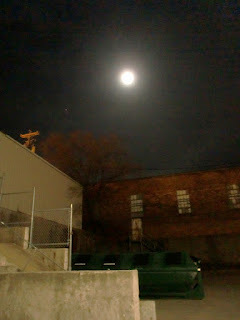 Apparently it was centered over our town and dumped all it had. But it had been so warm that it was gone by suppertime. Weather in Iowa is weird! 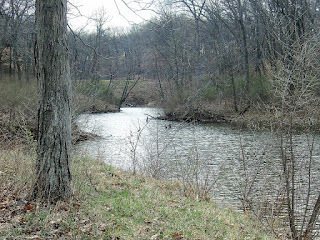 As I write this post, it's almost 70 degrees. But I've seen the forecast and we're to have more of the white stuff in the next day or two. 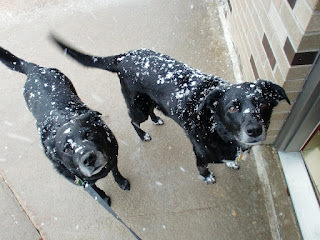 So the girls will go out and play in it, look like Dalmatians for a little while and then track it all inside. It's a good thing they're trained to give me each foot to be toweled off. 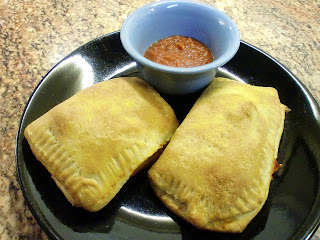 This is one of my favorite alternatives for "pizza and a movie night." With just three (or four) ingredients, you can have a hot snack that's something out of the ordinary. 1. Preheat oven to 425 degrees. Line baking sheet with nonstick foil. 2. Unroll crust on cutting board and stretch to a 12-inch square. Cut into quarters and move to baking sheet. 3. Cut meatballs in half and pile at one end of the square. top with a handful of cheese and then cover with sauce. Repeat for all four squares. 4. Fold over and crimp the edges closed with a fork. 5. Bake at 425 degrees for 10-13 minutes, until crust turns golden. Heat remaining sauce and serve on the side. The mornings are the worst. I work nights at the newspaper as a copy editor, so early mornings are pretty difficult. But those few minutes I have with Danny before he goes to work are extremely precious, so I gladly roll out of bed to be with him. Lately, though, I've been waking up with every muscle in my body clenched. From my neck to my shoulders to my lower back, I'm just as tight as can be. Perhaps I was alligator wrestling all night. Or maybe I'm just having problems relaxing. Sometimes I think I'm putting in a full day's work and then trying to accomplish some more while I sleep. It's not like I have stress in my life ... note the touch of sarcasm ... like we all do. Balancing home, husband, work, family and the extra stuff isn't easy. God never said it would be. And we think we have to function at some super-hero level that wins us awards and accolades. But God never said we did. The longer we spend on this earth and the more goodness and mercy we receive from the Lord, the more we should be praising Him. 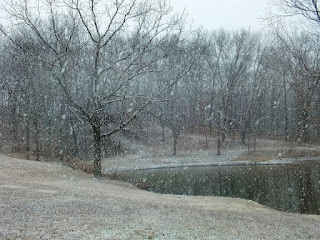 Whether it's the beauty of a snowy day, a moment of joy in a sorrowful time or forgiveness when we need it most, we have countless reasons every day to lift our voices in praise. David knew exactly what we know now: God is great and greatly to be praised. We have more to praise Him for today than we did yesterday simply because of His greatness. Make this a weekend of giving up complaining, bitterness and self-pity. Let every single word that comes out of your mouth offer up praise to our God, for He is worthy of praise. Now that warmer temperatures are setting in, the ice on our ponds has broken up. Apparently that is an invitation for all of the local geese to join the menagerie on the property. At first there were just two and they were a pretty pair to watch on the water. Then two became four ... and then seven. 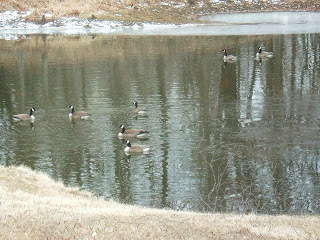 Now I think there are five or six pairs on the pond at any given moment. This wouldn't be so bad if they weren't noisy as all get-out. They'll start honking for no apparent reason, and then they all have to join in and complain. It goes on most of the day, but it's especially bad about 10 minutes before the alarm goes off in the morning. I think about Christians when I hear the geese honking. We squawk about the circumstances of the day. We raise our voices over how people are supposed to (or not supposed to) act, talk or think. We might even honk in frustration to God over the little things.